Siphonina bradyana, copyright Renata Moura. 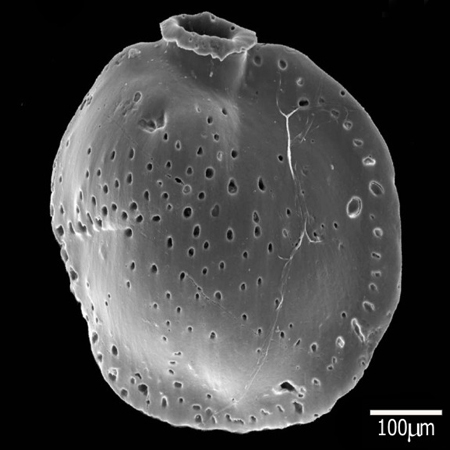 The Siphoninidae are a group of Foraminifera known from the Eocene to the present, commonly bearing a frilled keel around the outer edge of the test (Loeblich & Tappan 1964). Characters (from Loeblich & Tappan 1964): Test trochospiral or may become uncoiled or biserial, periphery commonly with fimbriate keel; aperture oval, bordered by distinct lip and projecting on neck.